You know it's the festive season when Starbucks bring out their red holiday cups. This year the cups are designed by Ukrainian-born Canadian Anna Bucciarelli, who has brought a little Ukrainian folk flavour to your coffee. 35-year-old Bucciarelli, who was born in Kiev and moved to Canada in 1997, took the inspiration for her design from traditional Ukrainian Petrykivka decorative painting. The cups include some conventional holiday features, such as a snowy village, a Christmas tree, and Santa, as well as references to Petrykivka. “This is my interpretation of what Petrykivka would look like on a modern cup. While it is not pure Petrykivka, it has the elements of it: flowers and abstract elements like little feathers,” said the artist, who spoke of her excitement to share Ukrainian culture in an interview with the Kyiv Post. 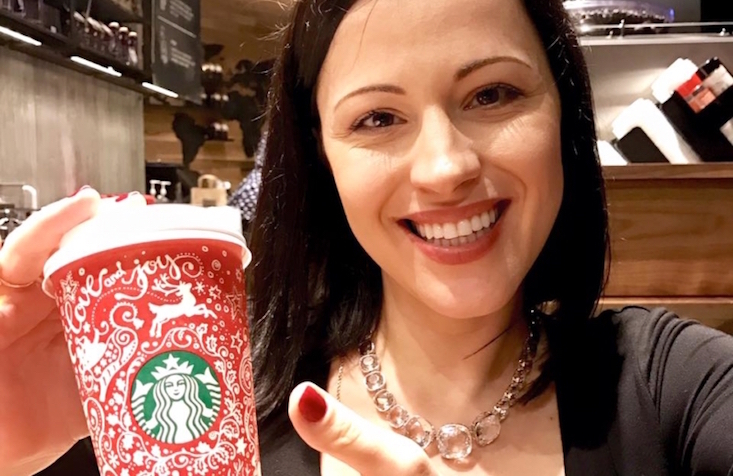 “I was so pleased that Starbucks let me talk about my heritage and what inspired the design of the cup,” Bucciarelli said.